Provide comfort for the family of Virginia Thomas with a meaningful gesture of sympathy. CAMDEN – Virginia (Gina) C. Thomas, 99, went home to be with her Lord and Savior, March 29, 2019 at the Sussman House in Rockport surrounded by family and friends. Born in Rockland, October 31, 1919, Virginia was the daughter of Parker S. and Hattie L. Emery Merriam. She grew up in Owls Head on Sunny Acres along with her twin sister Dorothea “Doffy” and two brothers, Donald and Paul. She attended schools in the Rockland area, graduating from Rockland High School in 1938. After graduation Virginia worked at Sears Roebuck in Rockland, obtaining the position of manager. She married Rockland native, Richard Thomas, in Pensacola, Florida, on March 18, 1941. Richard was a photographer with the US Navy and after the war worked as a Civil Engineer taking the family to New Jersey, Newfoundland, and California. The family eventually settled in Camden. Virginia was an active member of Camden’s Chestnut Street Baptist Church for over 60 years. She was a longtime member of the Knox County Extensions and was a talented craftswoman known for her braided rugs, sewing, cooking and gardening. Her children remember walking home for lunch during school where she would be waiting with lunch. She loved the outdoors, especially, hiking, skating, biking, and skiing at the Snowbowl. Her family fondly remembers many summers at their camp on Moosehead Lake and time spent at her former home on Hosmer Pond. She is predeceased by her husband Richard E. Thomas; her son Richard D. Thomas in 2006; twin sister, Dorothea Gross in 2018; brothers, Donald Merriam and Paul Merriam; and a nephew Fred Merriam. Virginia is survived by daughters, Jean Small of Bangor, Barbara Thomas of Lincolnville Beach; grandchildren, Katrina (Cory) Underhill of Camden, Shawn (Mai) Berry of California, Peter (Amber) Small of Bangor, Alex Small of Bangor, and Samantha Thomas; great-grandchildren, Nicholas Sukeforth, Jake Underhill, Dustin Underhill, Emma Small, Isabell Small, Parker Small, Thomas Small, Zoe Small, and Oliver Small; and fondly remembered by many nieces and nephews. A funeral service will be held at 3:00 p.m., Saturday, April 13, 2019 at the Chestnut Street Baptist Church, 29 Chestnut Street, Camden, with a reception to follow. Pastor Wayne Wallace will officiate. In lieu of flowers, donations may be made to the Sussman Hospice House, 40 Anchor Drive, Rockport, Maine 04856. All are invited to a reception immediately following the service. Provide comfort for the family of Virginia "Gina" Thomas by sending flowers. Heartfelt condolences from the Cottas. Gina was an amazing friend and support for our mother when she was sick. Gina would pick out an interesting fruit at the store and share it with Mum, knowing that would tickle her! She did this often on her many visits to Rawson Avenue. Please feel the love and prayers from our family, Jean and Barbara. Our prayers are with our dear friend, Jean and family. May you have peace in the knowledge that Virginia is in the loving arms of Jesus. 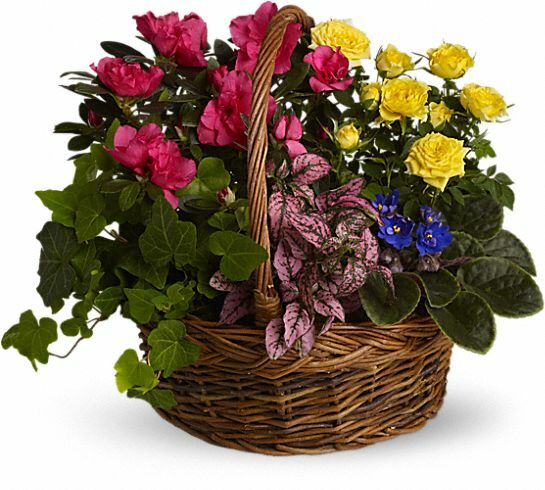 Heartfelt Sympathies Store purchased the Blooming Garden Basket for the family of Virginia Thomas.